Mrs Daine joined the preschool team as our Supervisor in January 2018. 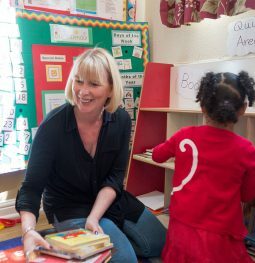 She has had a vast amount of supervisory experience within the early years preschool settings and reception classes in schools, having qualified to degree level in 2011. Mrs Vail-Baillon joined Watnall Preschool in 1995, and has been the Deputy Supervisor since 2011. 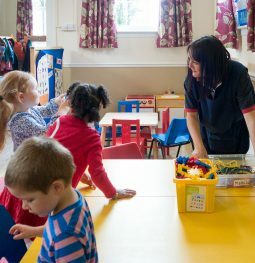 Underpinning her years of experience is an NVQ3 Early Years Care & Education qualification. She is also the designated Safeguarding and Health & Safety person. Her two children both came to Watnall Preschool when they were young. Mrs Meadows has been a member of the team at Watnall Preschool since 2010, and since joining, she’s qualified as Special Educational Needs Co-ordinator (SENCO). She adds this skill to her NVQ Level 3 qualification in childcare – not to mention her experience raising her own three children! Like her colleagues, Mrs Meadows sent all her children to Watnall Preschool when they were little. Miss Chamberlain joined the preschool team in July 2017 – recommended to us by the parent of one of our little ones! She completed her NVQ level 3 in 2004 and has worked within nurseries and schools, and is mummy to two young children of her own. Miss Daine-Clarke joined the preschool team in January 2019. She completed her NVQ level 2 in early years in 2018 and is looking to start her NVQ level 3 this year. Mrs Hipkiss joined the team in early 2018, Like her colleagues, Mrs Hipkiss sent all her four children to Watnall Preschool when they were little. Miss Jeffs has worked as Administrator at Watnall Preschool since 2010, completing her Diploma for Children and Young People’s Workforce Level 3 in 2014. Her son attended Watnall Preschool when he was small.